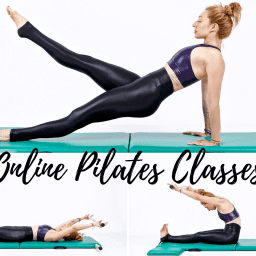 This week, we will get through the whole mat in 30 min (complete with modifications if needed) because a little of each exercise will go a long way in our Pilates practice. I don’t know about you but this is the hardest part of the holidays. I can get through Halloween and Thanksgiving, but my will power not to indulge at every party is waning. Thankfully, all year long we have been practicing quality over quantity in our Pilates practice and that applies to party treats too! START DATE & TIME: Tuesday, December 11, 2018 2:00pm PST (check your timezone). If 7 days from class start time has passed, you can find the next available class here. EQUIPMENT NEEDED: Your awesome self and a mat! Enjoying Lesley’s teaching style? Willing to travel? Explore the world while maintaining your practice by joining Lesley on a Pilates retreat. 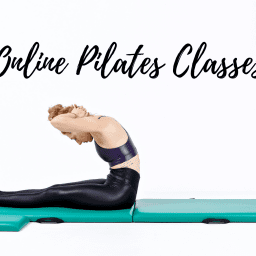 When doing Pilates it’s easy to get obsessed with your core or keeping your shoulders out of your ears. But, the more connected you are to your seat the stronger your entire body will feel. Some of those notorious hip grippy exercises like Spine stretch forward teaser will become more tolerable and you may even find you enjoy them a little bit! Joseph Pilates created the Mat work first, then saw how hard it was for people (I mean, you know) and designed the Reformer. In this week’s mat class we’ll take some of the exercises from last week and continue to add on! If you’ve never been on a Reformer don’t worry. The Reformer exercises were born from the Mat so you’ll recognize a lot of the spine shapes. It’s easy to think about the curling higher in Pilates or reaching more in an exercise. But, what about the “pulling” action in Pilates? And, how can you Pull from the right place to allow you to curl higher and reach more? 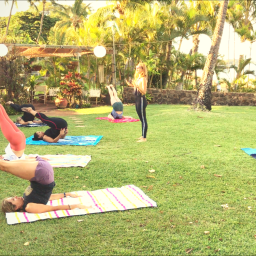 This weeks class we think about pulling from a few different places in every exercise to help us dive deeper into our entire mat! We flow in this class and you don’t have to worry about anything but where to pull from! Are you ready? See you on the mat! Good morning, it’s (almost) the final class of our retreat and today I asked our group what they want to do in this class. After a week of doing Pilates every day, there are just some exercises that our bodies haven’t opened up to yet and some that they really love. So before we do class I’m going to ask them what they want and that is what class will be about – right there on the fly! So in 2019 you have to just come and join us! In our mat work we pay a lot of attention to flexion and extension. And, we often forget the side work. Sure, the twists do touch our sides and there is the amazing side kicks. But, how can we use all the other exercises to really rock our side bodies and strengthen us from side to side as much as head to toe? Find out this week when we meet up for a side body adventure on our mats! Are you ready for a little magic? I know I am! It has been HOT here and so motivating to workout is not the easiest thing. But, thankfully, the mat can be done in 30 min or less. And this week’s class is no different! This week, I’ve brought in the Magic Circle. But, you don’t have to have one to still get your Pilates and sweat on! If you have a ball or block grab it and if you have none then I’ve got some tips for you too. Hope you enjoy it and I’ll see you next week where we see just what we can do when we “pull” a little more! The Seal! Typically considered a harder version of Rolling Like a Ball. But, is it? Or, is it a time for you to shine? I know for me the first time I did the seal I thought it was a funny exercise. I wondered why we even did it. And, then my teacher Jay Grimes reminded me that its a time to show off. To show that you can clap your legs in and out while maintaining balance. And not just at the top of the Seal but at the upside down part too! Are you ready to let your Seal shine? Let’s Seal it Off together this week! There is lots of cues regarding the shoulders. Too often “shoulders down” is a quick fix cue thrown out there. Or, even, “don’t use your shoulders…”. But, what does it feel like to have your shoulders connected? Is it down? Is it back? How will it feel to simply focus on the shoulders throughout the whole mat workout? Well, take this week’s class and find out! I can tell you I can feel the effects after just one time doing this class. Enjoy your shoulder explorations! I am the biggest fan of a good Swan exercise! I absolutely love to do this exercise. It feels so good when I connect to all the right spots. But, how did Joe do it in his book? That’s what we will explore this week as well as a few other OG versions of our Mat work from his book Return to Life. Which if you haven’t read you should! It’s pretty great at guiding you through his mat practice. Are Single Leg Circles a Circle? What about Hip circles? And how many other exercises do we create a circle? Or, are we simply twisting? Let’s investigate how each of these exercises sets us up for the next! I know you love the Reformer! Who doesn’t?! Well, in this week’s class the Reformer meets your mat. Get ready to footwork, row and snake away on your mat. Who needs a reformer when you’ve got your imagination and your muscles? The weight pole aka bar in the Pilates Mat can be used for more than just the Roll Up and the Thigh Stretch. 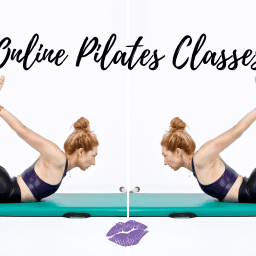 In fact, it’s purpose in those two exercises can be a tool for many different Pilates Mat exercises! If you do not have a pole, weighted bar you can try 1lb weights, a dowel or a theraband. If you have none of those items I do give ways to do this class without and it will still be a challenge! So, no need to skip this week! I hope you have fun finding your back strength and playing with the way connecting to your back with this pole can affect more than your Roll Up! But, on the mat it’s all you! There is not equipment to help you “finish,” just yourself. And, as the movement goes on you may not want to be back in your original start position. In fact, when you’re flowing some exercises finish when the next one begins. This week we focus our thoughts on how wide our backs can get! There is a difference between rounding your shoulders and widening your back. And, this key difference will not only make you stronger but it will make all those overhead and rolling exercises more possible! Want Control Balance to feel lifted and strong? Wish you could clap your feet 3x during Seal? Want your ribs to stay connected? Then, it’s time to open your mind to the wide back! You know your arms are attached to you back. But, feeling that and moving from your back can be tricky! Which is why in this week’s class we will start with some back feeling preps and then use those connections throughout our practice. If you have a magic circle bring it. If not, don’t worry. You’ll be able to do some actions and visualizations to find your wings. That was superb! It made me realize that I use too many words. Thank you! And thank you for being out of breath like a real human. OmG that class at MF was so fuN! It’s good to know we can do it in 10 min or 30 min! Thanks for cardio-ing it with me!